To celebrate some personal milestones, I took the staff of The Socialite out for a night on the town. This was to be a classy evening, dressing up for the occasion, and including some rare indulgences. We had dinner reservations at Revolution, which marked our first time patronizing this fine establishment. It's a deceivingly large space, but still retains a sense of intimacy. 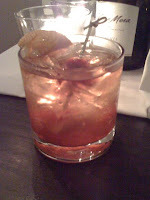 I started off with an old fashioned (pictured to the right) which was a bit fruity for my taste, but was still well made. We ordered the Venison Carpaccio as an appetizer, which was tender and flavourful. To continue with the wild game theme, I had the Grilled Bob White Quail for the main course. It was cooked in a Southern inspired manner, and was a delicacy. To continue the theme of the evening, we walked over to the recently opened Whiskey for after dinner drinks. To our dismay, they ended up being closed for the evening due to an issue with the building (see Barry's post). At this point, we had a thirst for top shelf scotch that needed to be quenched. The next place that came to mind was The Cellar at West End Wine Bar. Our streak of bad luck (or timing) continued, as The Cellar was shut down for the evening due to a private event. Our hopes were dashed again at our next stop, as Piedmont had already closed down for the evening. We finally found our first lick of scotch at the Durham Convention Center's bar, a nice Lagavulin Single Malt Islay. 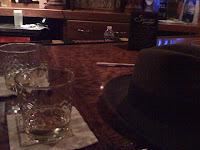 With our feet rested and our hope reignited, we continued our whiskey quest and found ourselves at the Sirens Lounge. It appeared our luck had turned, as we had a few different scotches to choose from. The bar at Sirens is massive, and has a built in fish tank. The lounge and dance floor started out on the quiet side, but then a bachelorette party arrived to liven things up. 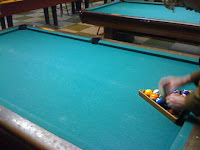 To wind the evening down, we went over to The Green Room to shoot some pool and drink some beer. All in all, a great evening in Downtown Durham.